Portuguese poet; born in Rio de Janeiro, Brazil, May 8, 1705; died at the stake in Lisbon Oct. 19, 1739; son of Jaão Mendes da Silva. He was educated at the universities of Lisbon and Coimbra (B.D. 1726). On Aug. 8, 1726, he was arraigned before the tribunal of the Inquisition for writing satirical poems and for observing the Mosaic laws; an inquiry was instituted; and he was tortured so cruelly that he was unable to sign his name. At an auto da fé held Oct. 13, 1726, he was pronounced penitent. He continued, however, to practise his old religion in secret; and his enemies, envious of his growing fame as a poet, accused him of relapsing and of irreverence toward the Holy Office. On Oct. 5, 1737, he and his wife were imprisoned, his property was attached, and a number of spies, disguised as prisoners, were engaged to watch him. His wife was released on Feb. 28, 1738, but was arraigned anew on March 15, and sentenced to do penance for relapsing. She died Oct. 10, 1739, at the age of twenty-seven (according to some authorities she survived her husband several months). At a secret session, held March 11 of that year, Da Silva was denounced as a heretic, and his goods were confiscated. Repeated efforts were made to save him by distinguished statesmen and poets, even King John V. interceding for him; but all proved fruitless, and, as stated above, on Oct. 19, 1739, he was publiclyburned, his family being compelled to attend the auto. The same evening one of his popular operettas was produced at the theater in Lisbon. Da Silva, who has been frequently styled "the Portuguese Plautus," was a very prolific and versatile poet; and his comedies were popularly called "operas do Judeu." They were performed at the Bairro Alto between 1733 and 1738, and met with marked success. Ferdinand Wolf has given a careful analysis of Da Silva's activity; and, though the literature bearing upon him is quite extensive, this still remains the best attempt at an appreciation of his literary importance. Until the end of the eighteenth century all of his compositions were published anonymously for fear of the Inquisition; and it was long before he was credited with the authorship of his many poems, dramas, and comedies. Many of his dramas give his name acrostically, after the fashion of the Jewish liturgical poets; but Varnhagen ("Florilegio da Poesia Brazileira," i. 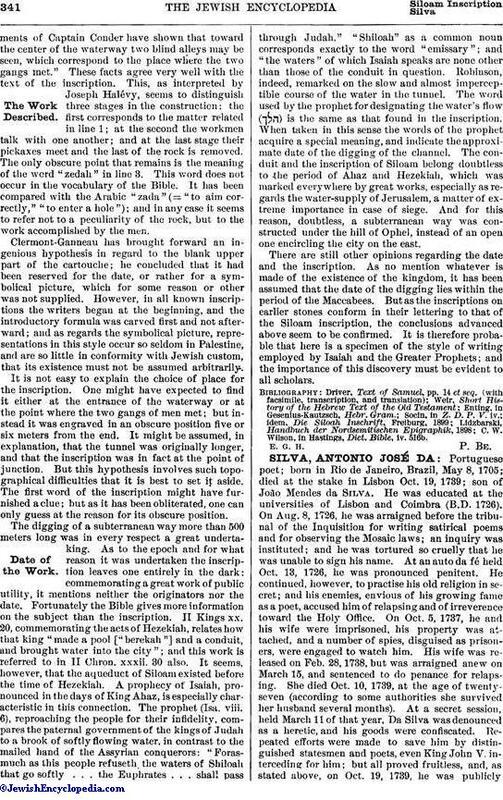 201-236, Lisbon, 1850) has pointed out that numerous spurious compositions also are attributed to him. Among Da Silva's most noted works are the following: "Vida de D. Quijote de la Mancha"; "Esopaida, ou Vida de Esopo"; "Os Encantos de Medea"; "Amphitryão, ou Jupiter e Alcmena"; "Labyrintho de Creta"; "As Guerras do Alecrim e Mangerona"; "Variedades de Protheo"; "Precipicio de Faetonte"; and "O Diabinho á Mão Furada." Numerous unpublished pieces are mentioned by Varnhagen; and one or two have recently been discovered and printed. Ferdinand Denis in his "Chefs d'Œuvre du Théâtre Portugais" (pp. 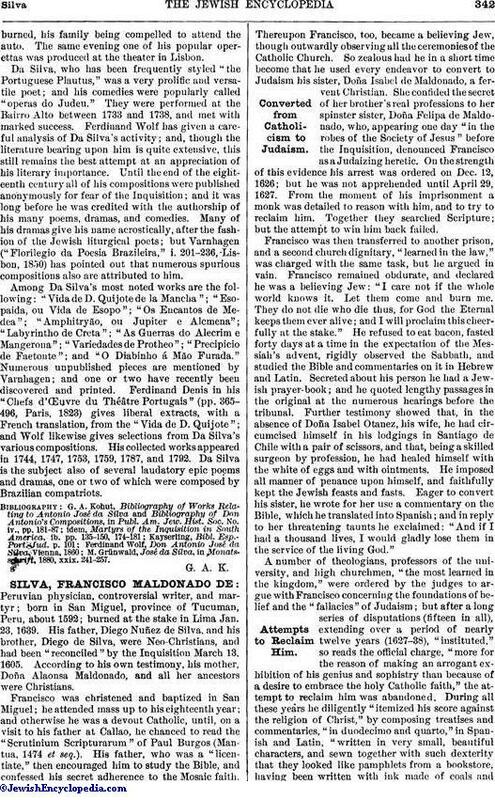 365-496, Paris, 1823) gives liberal extracts, with a French translation, from the "Vida de D. Quijote"; and Wolf likewise gives selections from Da Silva's various compositions. His collected works appeared in 1744, 1747, 1753, 1759, 1787, and 1792. Da Silva is the subject also of several laudatory epic poems and dramas, one or two of which were composed by Brazilian compatriots. M. Grünwald, José da Silva, in Monatsschrift, 1880, xxix. 241-257.